Social media bots have become an increasingly challenging issue. They can trick you into buying stuff or even influence your opinion (read more about the trouble they can cause here). But one way to spot – and stop – bots is by using their own friends. Who wants to have friends who are just there to ‘sell you stuff’. Correct! No one! 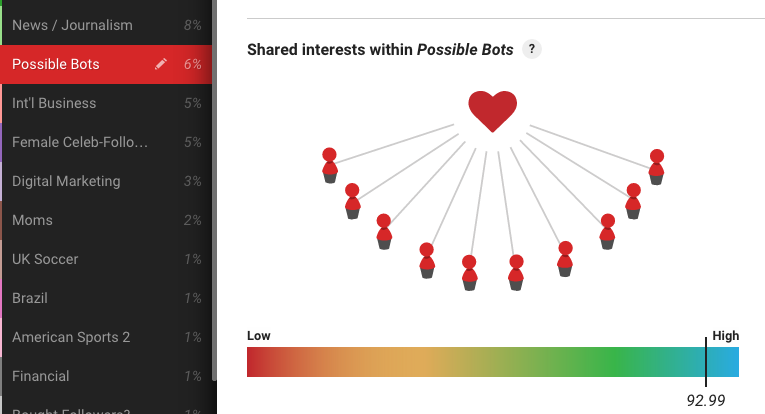 Being a bot is being lonely – or hang out with other bots. To demonstrate this I teamed up with Affinio, a company co-founded by Tim Burke (@t1mburke) that looks at social communities for brands. Often brands measure social media activity as a whole, where every engagement counts equally. That is not entirely correct however, because normally a brand wants to only address their specific target group. Does your Twitter account equals your brands target group? Not necessarily. Affinio showcases this. As a nice side effect one can easily spot bots since they form – unintentionally – communities of themselves. Let’s take some Top Social Media “Influencers” (Link to List). 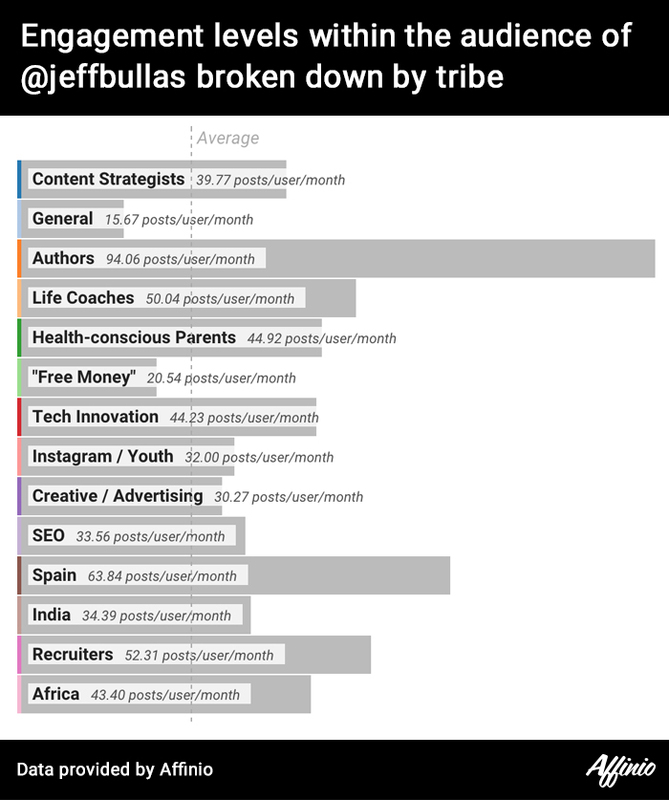 We analyzed the communities from @jeffbullas, @briansolis and @AmyJoMartin. At a first look Amy Jo Martin’s twitter followers look rather inactive. Many of them have no uploaded image, but show only the pre-set “egg” user image from Twitter. However that might not necessarily mean that those guys are bots – it might just be that those tweeps are just less active – they did not even bother to upload an image. The lower level of activity, however, is easily seen. If one clusters the Twitter followers for both Jeff and Amy. One will find that Jeff’s least active followers tweet about 15 posts a month. While Amy’s has five groups that tweet below 1 post a month. Affinio’s strength is to analyze communities and identifying who is “influencing” each member of the community – meaning who do most tweeps in this community follow. If, however, one purchases a thousand bots like I did in my experiment with @spotthebot (see this movie about it), these bots are often sold to others as well. The bot owner had build them and now resells them over and over again. The consequence: all bots follow the same persons. Said differently these influencer of one group of bots can be seen as the “customer list” of these bots. @AmyJoMartin has one community that follows 92% the same tweeps. This is a uniformity we have not seen since breakup of the Soviet Union. Meaning – this is not human. By comparison, Jeff Bullas and Brian Solis have only a maximum follower similarity in their different audiences of 45% and 40% respectively. Thus Amy has bots who follow her. Looking at the community becomes easy to see that not every “influencer” is as influential as we might have thought. If you want to learn more about ‘influencer’ and the way to measure them read this free chapter on marketing from my Book “Ask Measure Learn” by O’Reilly Media. Please note that Amy has not necessarily purchased those bots. As pointed out in this post, it might just be that others bought them to harm her or maybe a bot programmer used Amy to make their bots look more natural. If you are a software engineer you already might think that all those issues with bots can be easily circumnavigated. Bots could upload images automatically. Bots could be more active – just tweet from an rss feed. And yes, bots could be more careful who they follow and how regular they tweet. You are right! Every time a network spots and removes a bot the programmer understands that she will need to change the algorithm. Because of this unintended feedback look a well well-known dating service took action and no longer removed identified bots. Instead they moved them into a virtual chatroom where spam bots meet up with bots from the dating site. This way the programmer will not know for a while that her bot was detected. In the end, we need to trust that it is in the best interests of social networks to do all they can to remove bots. Most of them now offer a way to get certified or to identify a bot now. By doing so they can train computer programs to spot bot activity. Bots are a reality and they will try their best to influence us. And they might be even more successful in the area of Big Data. 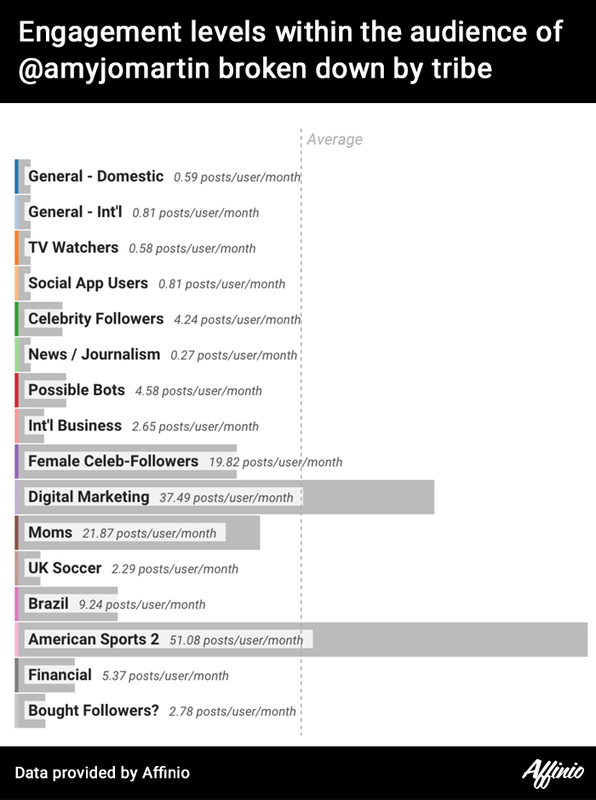 Bots are generating data as well, and this data migh skew our algorithms such as trending content. We will need to master them as much as we have mastered SPAM, and learn to fend them off in the same way we have learned by now not to send money to a Nigerian prince. But maybe someday soon bots will outsmart us. But only if the computer become more intelligent as Nick Bostrom discussed in his excellent book “Superintelligence“. Until then, we should just be cautious about which prediction systems we believe. This entry was posted in Blog on February 26, 2015 by Lutz Finger.